As members of this community, we show pride and respect for Enfield by taking seriously our responsibility to be active citizens. Through our actions, we demonstrate genuine concern and compassion for our neighbors. As John Donne so eloquently wrote “No man is an island entire of itself; every man is a piece of the continent.” While our Enfield community may be composed of individuals, none of us are alone. We are all part of the patchwork of this town and are compelled to act when someone is in need. Whether it is donating time, money or goods, preserving our natural resources, helping clean the streets, walking for a cause or just helping someone with some yard work, you can find Enfield Republicans out doing what they can to help make our community a better place. Two organizations in town receive many hours of Republican volunteer time … The Enfield Food Shelf, on Alden Avenue and Enfield Loaves and Fishes, on Prospect Street. 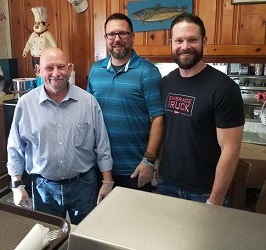 Both organizations are committed to providing meals and fellowship to the poor, hungry, and disenfranchised within our community and Greg Stokes has been a volunteer at both for a very long time. 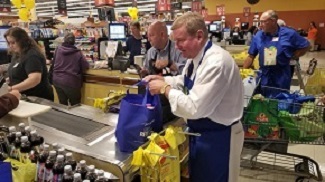 State Sen. John Kissel (front) with State Rep. Greg Stokes (back) helping out at ShopRite’s Help Bag Hunger event. In Philippians 2:4, it says “Let each of you look not only to his own interests, but also to the interests of others.” Living in a community means taking this message to heart. And that is what we try to do every day. Whether it is picking up trash around town, donating to a local food pantry, volunteering one’s time with a local event or just helping someone in need around the house, we understand the importance of looking out, not just for our own interests, but also the interests of others. We are one community. We are one Enfield. And we are stronger when we work together for the betterment of others. 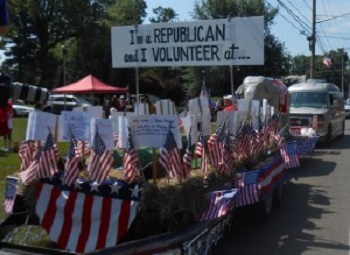 The Enfield Republicans believe community service is the best work of life and we all live it every day.